We have all heard of curb appeal for homes, but do we truly understand the importance of it? In a time when supply outweighs demand in most real estate markets across the country, first impressions are extremely important. You want your home to have a “wow” factor. Most people form an opinion of the home before they even step inside the front door. Most likely, you have gone to great lengths to make sure the interior of the home is up to par. Don’t forget the outside! Here, we will discuss the importance of curb appeal and how to help achieve a home that really stands out in the most positive way! Even if you don’t plan on listing your home for sale in the near future, or even at all, great curb appeal is still a factor. Think about all the times you were driving through another neighborhood and said to yourself, “What a lovely house!”. A well-maintained house looks more like a home, and it looks warm and cozy to whoever sees it. We all want our home to be worth as much as possible. Even if the interior of the home is impeccable, you still need fantastic curb appeal to boost home value as much as possible. Great curb appeal attracts buyers since chances are they are beginning their search by exploring neighborhoods and looking online. Now that we know why curb appeal is so important, let’s take a look at the best way to achieve it! Nothing ruins curb appeal like a messy yard. Keep the lawn weeded and mowed, and plant some attractive shrubbery or flowers, if possible. Make sure all lawn equipment, such as mowers and rakes are put away when the job is done. Keep the yard free of clutter such as bikes and toys. Keep the backyard clean as well. Always clean up after parties and gatherings. Power home is one of the quickest ways to get great curb appeal and add instant value to the home. Keep the exterior and finishings such as decks free from dirt and debris. The right lighting can add a dramatic flair to your home. Shop around for some new, updated lights to put by the front door and along pathways leading up to the home. This can also showcase all of the hard work you’ve done in the yard, so people can appreciate it long after the sun goes down. Your door is your focal point for your home. Making sure it’s updated is going to go a long way for your curb appeal. Old beaten up doors make your house look worn. But you don’t need to replace the door to upgrade it. Instead, try replacing your decorative glass with a new design. Or if you don’t have glass in your door today, you can cut a hole and add glass in less than an hour. Decorative door glass is an easy way to make your front door shine. 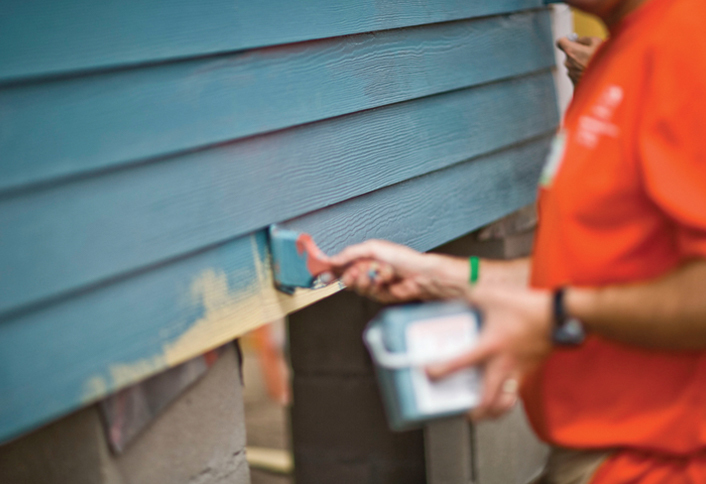 Make sure the paint on your home looks as fresh as possible at all times. Apply a fresh layer to the exterior every few years, and make sure to repair any chips in the features such as the eaves. This conveys the image of ownership pride and helps your home rise above the competition! The roof is easy to forget. Ensure that it is in great condition at all times by cleaning shingles, replacing sealant, and trimming branches. Symmetry is appealing to look at, and easy to do! Perhaps you can put matching potted plants on either side of the walkway. Or maybe use lighting fixtures to create symmetry and balance in light. Great symmetrical front-door accents can create a welcoming entryway and boost curb appeal. Driveways are often overlooked. Fix cracks, remove weeds, and repair other noticeable flaws. Keeping this clean and in good shape will do wonders for your curb appeal. Looking for more ways to improve the value of your home? Shop thousands of home improvement products and get expert advice on how to increase the value of your home.